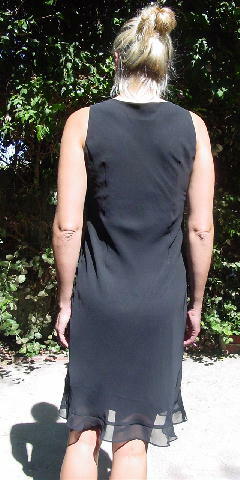 This black sheer sleeveless dress is 100% polyester and has a shorter black polyester non-see-through lining. It has a wide scoop neckline and scalloped edges at the bottom of the dress. The dress is 5 3/8" longer than the lining. There is a very tiny thread pull 3 1/2" inward in the front from the left seam and 23" down from the neckline. shoulder to shoulder 12 3/4"